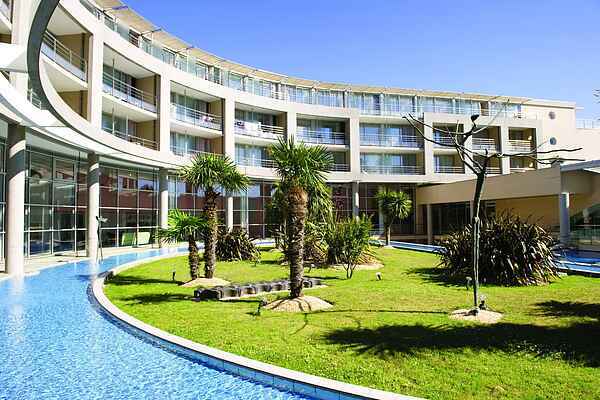 Les Jardins de l'Atlantique is a modern, moon shaped building, offering views of the Atlantic Ocean. This is a wonderful place to enjoy walks in the adjacent pine tree forest, to be active or to relax in your holiday resort. It hosts several swimming pools, both outdoor and indoor, as well as a range of wellness facilities. For the little ones, there's a crèche. Children from 3-17 years old can take part in the various kids' clubs that are organised during school holiday periods. The beach is around 150 m away and the marina of Bourgenay can be found within 300 m. The Vendée region is known for its vast, sandy beaches and lively seaside resorts such as Les Sables d'Olonne (approximately 12 km away). The holiday resort consists of more than 100 hotel rooms and around 14 three-room apartments. The accommodation type that can be booked through us is limited to the apartments.